We’re back today from our (very) long Bank Holiday weekend, raring to go and bring you a new selection of informative and entertaining webinars. I know many of you probably didn’t get the full four days off, and for that you have my deepest sympathy, but I hope you all had a good weekend nonetheless. If you were working, the good news is you can live vicariously through me as I regale you with my fascinating tales of adventure and heroism. On Saturday, I visited Blue Planet Aquarium near Cheshire Oaks for the first time in about 15 years. The first thing that struck me was how little seems to have changed in the intervening decade and a half. It was something of a nostalgic trip back in time for me, and an enjoyable day out, but it made me ponder how aquariums tend not to attract the same investment, either financially or emotionally, as zoos do. Last week the world’s last male Northern White rhino died. It made international news. The rhino had a name – Sudan. More importantly, he had a Twitter page with 2,300 followers. There was an outpouring of grief on social media at the effective extinction of this charismatic animal. It’s understandable, but it did spark the cynical side of my brain to wonder whether the death of the last Pondicherry shark would draw the same reaction – if indeed it isn’t already extinct. Overfishing led to a sharp decline in the Pondicherry sharks’ numbers, and no confirmed sightings have been made since 1979, although some experts believe a blurred photo snapped by holidaymakers in Sri Lanka in 2016 could be a Pondicherry. Even if this is the case, we are still talking about an animal that used to be found commonly along the shorelines of two oceans before human interference took its toll, now reduced to near depletion. But have you ever even heard of the Pondicherry shark? When was the last time you saw a news article about that? How many Twitter accounts do you think are dedicated to the Pondicherry shark? I’ll give you a clue – it’s the same as the number devoted to the equally endangered Red Sea Torpedo and Tentacled Butterfly Ray. I’ve written in a previous blog about how people have been made apathetic to the decline of sharks, but walking through the aquarium and seeing just how many marine species are listed as vulnerable or endangered make the reality starkly clear to me. The hidden destruction of the oceans is happening at an appalling rate, and what’s more appalling is how little is being done to stop it. Only 3.4% of the world’s oceans have been designated as protected, compared to almost 16% of our planet’s land area. The problem is that a lot of people simply aren’t bothered. It’s a lot easier to dismiss marine life destruction. Seeing a stack of illegally harvested shark fins isn’t as emotive as seeing the corpse of a rhino with its horn hacked off. A bleached coral bed doesn’t look as severe as miles of deforestation in the Amazon. 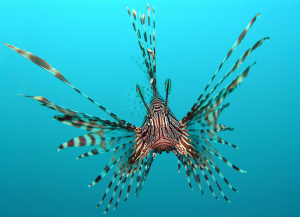 The sea is an alien world, and fish are strange creatures. They aren’t particularly cute or loveable. People rarely form emotional bonds with crustaceans (although Homer Simpson did briefly have Pinchy the lobster as a pet). The outrage simply isn’t there. Instead, people donate their money to causes protecting lions and elephants, while the sea continues to be pillaged and polluted. Places like Blue Planet Aquarium are fighting an uphill struggle to get people to fully appreciate what is going on. And, if people don’t care enough to kick up a fuss, corporations won’t let a little thing like conservation ethics get in the way of their juicy profits. I can’t help but think that, barring some kind of radical shift in attitude, the outlook for marine life is bleak. On Monday, I went to the Spaceport in Seacombe. What is that, you ask? For those who have never had the joy of visiting this wonderous and inspiring place of intrigue and imagination, Seacombe is a district of Wallasey on the Wirral. Oh, the Spaceport? That’s a tourist attraction about space travel and stuff. The Spaceport has a lot of good exhibitions about the solar system and beyond, and even takes you on a journey a long time ago to a galaxy far, far away to display some Star Wars memorabilia. One particularly interesting topic is the speculation about life in outer space. Could aliens be real, and much closer than we ever seriously suspected? True, the traditional ideas of little green men seem a little unlikely. David Bowie once asked if there is life on Mars, and the answer to that is a resounding no. None of the other planets in our solar system could support life as we know it. But one of Saturn’s moons, Enceladus, has been found to have an ocean of saltwater beneath a layer of ice. Interestingly, there are hydrothermal vents on the ocean floor that are very similar to those found on Earth. The water contains several elements, including molecular hydrogen which may be due to methanogenesis, a process that implies microbial life. 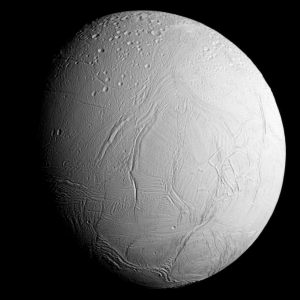 In other words, Enceladus could support life, theoretically. One thing we can deduce from life on Earth is that if life can exist somewhere, it probably will. There are creatures that make their home miles beneath the ocean surface, in the crushing pressures, with no light, in a place where it seems like nothing could survive, let alone thrive. If they can survive there, they can survive on Saturn’s moon. We don’t even fully know what lives in the ocean depths on Earth, so understanding exactly what is in Enceladus’ waters is currently far beyond our reach. If there is life there, it’s probably “just” microbes, but all life on Earth began in a similar fashion, and evolution took us the rest of the way. Is it possible that there could be advanced organisms reminiscent of Earth’s prehistoric life out there, living quietly beneath the surface of the frozen ocean? The rather exciting answer to that is yes, it is theoretically possible. The conditions there match conditions which known animals on Earth exist in. Whether anything actually is living there is a different question, of course. But, maybe one day far in the future, vets will be treating strange animals from the depts of the oceans on Enceladus. And you can rest assured, if that ever happens, we’ll have a webinar on it.